You guys. Green smoothies totally changed my life. And that's why I'm totally obsessed with them and want to share them with everyone and their mom. In the first few days, I noticed I wasn't starving and ravenous by 11 a.m. In fact, I craved lighter, more veggie-filled lunches. I felt more clear-headed and less tired throughout the day. I started having fun with different flavor combos, and seeing how many greens I could pack into my smoothies. I found myself looking forward to getting out of bed in the morning, excited to get blending. My jeans started feeling a little looser, my stomach a little flatter. In a few weeks, my skin was looking more radiant and glow-y, smoother and softer. I even had a little sun spot on my forehead that started fading and eventually disappeared completely. My eyes felt brighter. I had more energy. Instead of forcing myself to the gym, I noticed that I was looking forward to my workouts and wanting to get outside more for walks and jogs. Before I knew it, I had dropped five pounds that I hadn't even realized were hanging onto my body. With my clearer mind, I found myself able to listen to my intuition more closely. In fact, my entire outlook on life was shifting and becoming more positive and energetic. I felt empowered, capable. I even found myself in the midst of a job shake-up, eventually realizing I wanted to change fields completely - from digital advertising to owning my own company with a focus on healthy foods. Sometimes little shifts can be the beginning of a totally new trajectory. Green smoothies were this little shift for me. As someone who spent years trying to be healthy, but finding myself confused and frustrated with contradictory information on healthy foods, I am now in a place where I feel like I'm on the same team as food. I no longer need to fight it. I feel able to enjoy the deliciousness of all kinds of foods, while staying in control of my health. I feel balanced and never deprived. It has been four years since I started making green smoothies on a regular basis. I haven't gotten sick once (knock on wood!). There have been a few times when I felt a cold coming on, but was able to fight it off before it hit me. I have maintained my weight and when I do gain a few pounds here or there, I am totally not stressed because I know exactly how to get back on track. My hair and nails feel stronger and healthier than ever. My skin feels smoother, softer, and less fine line-y than it did five years ago. There have been multiple occasions where I roll my ankle or hurt myself and think, "Uh oh! That's going to hurt later!" But then am surprised to find myself injury-free. I am constantly blown away with my body's ability to cleanse, detox, and heal itself naturally. When I use the words "detox" and "cleanse," I am literally referring to the process of de-toxifying your body (I'm not talking about some ten-day juice fast). Why do we want this? When you de-toxify your body, you shed unneeded weight and toxins that are holding you back from being your most beautiful self. Your body can function at an optimal level, use the energy to repair your skin, hair, injuries and inflammation. Basically you're allowing it to be its best self. And, once your body has less toxins, it's able to absorb all the added nutrients you are consuming - further enhancing the beauty benefits. I'm telling you, green smoothies are magic. If you are going to make one change to your diet and to your day, consider trying out green smoothies for a month and see how you feel. Such a simple addition...endless benefits. You won't want to go back to life pre-smoothies. So, I give you, my first video tutorial. The Pink Greens Not-so-Basic Green Smoothie. I apologize in advance for the lighting in the video - and my hair, lol. My videographer friend came over for a smoothie meeting and I said - "hey, let's just film this video for practice!" So it was very impromptu. Thank you for hanging in there - the quality of these will get better, I promise! - GREENS - as much and as many as you want! Some of my favorites for good texture and flavor include - romaine, baby mixed super greens, spinach, cucumber, celery. Try to mix them up from day to day or week to week. These are the base of your smoothie and have the cleansing power. There are, of course, different nutrients in different greens, so you want to have a rotation of favorites so that your body can enjoy the benefits of a larger variety of naturally occurring vitamins and minerals. - FRUITS/BERRIES - use in smaller quantities. Choose lower-sugar/glycemic options like green apple, pear, kiwi, berries. Include frozen ones if possible. - LIQUID - keep it simple and go with just plain water or coconut water for some added electrolytes. - ADD-ONS/TOPPINGS - spirulina, chlorella, lemon, fresh ginger, cilantro, parsley, coconut oil, bee pollen. This is important. You want to tell your body it's awake and allow it to continue to detox and cleanse itself from while you were sleeping. 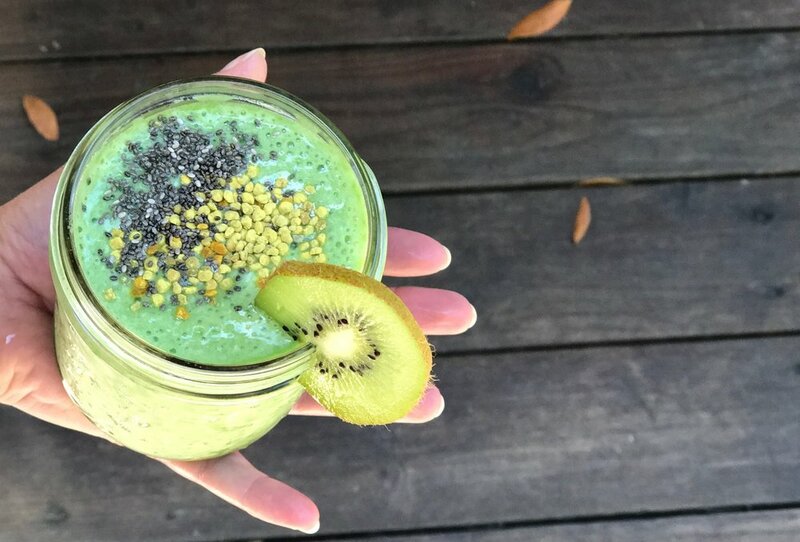 Drink your smoothie in the morning, before you put any gluten, dairy, meat, caffeine into your mouth (and yes, this includes your morning coffee. You can still have your coffee - just wait an hour or so after your smoothie to have it, and use a dairy alternative if you want extra credit!). The philosophy here is that when your body ingests meat/dairy/gluten/etc., it has to go to work processing them and, therefore, stops the detoxing process. And remember to have fun with it! Some of my early smoothies were borderline undrinkable (and come to think of it, sometimes they still are). i.e. carrots aren't the best in smoothies! Now I save them for juicing or making soups.. Just have fun with it and don't expect perfection. Below is the recipe I used in the video. Please don't get overwhelmed by the long list of ingredients...by no means do you need to use all of these things. Just focus on sticking to the guide above (greens + fruits/berries + liquid + add-ons). But I have found this to be a delicious combo. And with all the healthy foods infiltrating your kitchen, you may just find yourself stocked up on all of these! Combine all the greens with coconut water, blend well. Add the fruits, blend well again. Add the add ons, blend a final time. With this layered approach to blending, you get a smoother consistency of greens so they're not all gross and chunky. You also won't over-blend the more delicate ingredients like the cilantro. I recommend buying the 16-oz mason jars (can be found at any grocery store) because they are the perfect serving size, easy to pop in your fridge and even take on-the-go. Plus if you're prone to losing things (like I am), it doesn't break the bank!